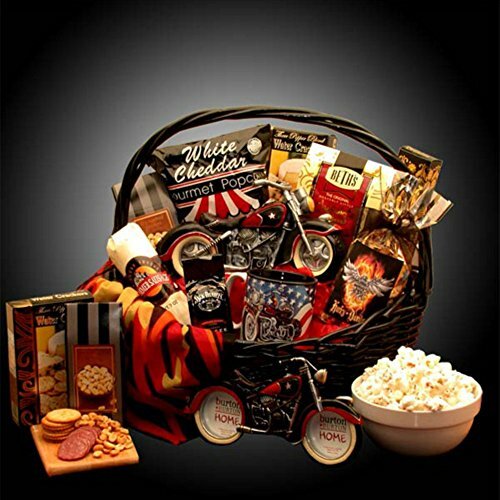 Weekend warriors and die hard motorcycle fans alike will love this Motorcycle themed gift basket. Filled with exceptional detail and charm these motorcycle mementos will be cherished for years to come. This Gift Includes: * Jack Daniels Coffee * Motorcycle Coffee Mug * Summer Sausage * White Cheddar Popcorn * Beth's Chocolate Chip Cookies * Three Pepper Water Crackers * Chocolate Cream Filled Wafer Cookies * Flame Riders Bandana * Harley Davidson Three Cheese Snack Mix * Ceramic Motorcycle Picture Frame * Ceramic Motorcycle Bank. Weekend warriors and die hard motorcycle fans alike will love this Motorcycle themed gift basket! This is a fun and unique biker gift suitable for any occasion!